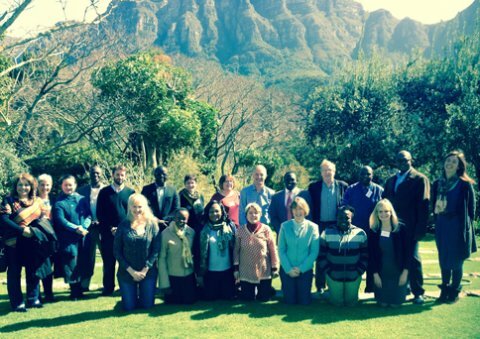 In August 2015 RESYST held a workshop in Cape Town, South Africa, which aimed to share diverse experiences from those involved in health leadership training in Africa and the UK about how to strengthen the workplace orientation of their training programmes. It explored important topics such as how training programmes can be organized to engage with workplaces, the role of e-learning, and how employers and line managers can be engaged to support learning. The overall aim was to support new thinking about leadership development and offer ideas for how existing programmes could incorporate a stronger workplace learning focus. The workshop reflects one strand of work within the RESYST Governance theme, which recognises new forms of leadership as critical in developing resilient and responsive health systems. In this blog Associate Professor Sue Cleary from the University of Cape Town, shares a few of her own thoughts that were stimulated during the workshop. Last month I was extremely excited about the opportunity to engage with a group of researchers, leadership development practitioners and health system leaders at a workshop on “Workplace based learning for health leadership development”. Over a 3-day period, we shared information, experienced new facilitation methodologies, visited a nearby district hospital as part of a ‘learning journey’, and were challenged and enriched through the diversity of views and experience in the room. For the past few years I have been thinking about the idea of enablement. Enablement can be an intangible idea but it has some parallels with the world of health promotion - where I think that there is common understanding that the provision of information (e.g. that smoking is harmful to health) is insufficient to change behavior. If only it were that simple! Similarly, in the world of leadership development, while a key step would include identifying leadership competencies (e.g. self awareness and self management), incorporating these competencies into my own leadership skillset requires me to enter into that journey for myself. This insight – that defining leadership behaviours does not necessarily translate into practice – I believe has implications for how we design leadership development programmes and here’s where the idea of enablement comes in. Put simply, the job of the leadership development programme is to create a doorway that is so inviting that at least some of the trainees decide to walk through it – i.e. work towards embodying the behaviours for themselves. What approaches enable individual leadership development? What approaches enable leadership development for teams? What approaches enable the embedding of effective leadership in the system? For each question, the diagram identifies some of the approaches and methodologies discussed in the workshop and that seem to reflect some of the state of the art in this area.